These beautiful glass hanging star lights were originally popular Christmas decorations, but are now used in home decor year round to bring a warm rustic glow to any room. Talented Mexican craftsmen have adopted the Moravian traditions and are now well known for their own handmade star lantern. This large mirrored glass starlight will bring an elegant southwest look to your home. Since each glass star fixture is hand crafted, color and finish may vary slightly from what's pictured here. Chain and ceiling plates sold separately. 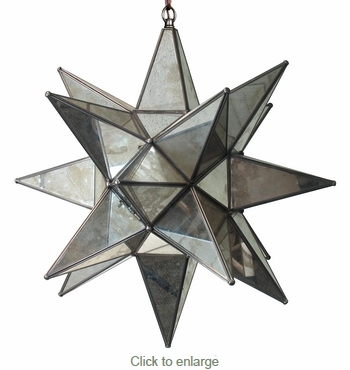 Medium Natural Tin Star Light Fixture - 16" Dia.